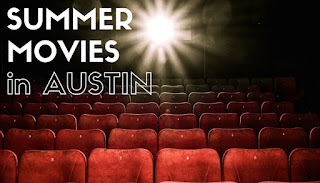 When you’re in need of a boredom buster for the kids and a break from the heat, there’s nothing better than cooling down in a movie theater with some popcorn and some laughs. Free and discounted summer movies offer a great way to keep the whole family entertained and occupied for a few hours, while giving mom and dad a little break. And lucky for us, we’ve got plenty of great flicks in store for July. It's just not summer without a weekday movie at Austin's Alamo Drafthouse! Watch new releases (Finding Dory is out!) and old favorites at Alamo Kid's Camp for $1-3. Hungry? Check out the newly revamped Alamo Drafthouse Kid's Menu. Click on the links below for each location's calendar. Cinemark Summer Movie Clubhouse - Watch ten fun films this summer for $1 per show or $5 for all ten. All movies begin at 10 am Monday through Thursday. All summer long, the Bullock Museum is presenting a biweekly Summer Free Film Series that is cat and mouse themed. These programs are free and open to the public, with seats available on a first-come, first-served basis. Seating for general public begins at 1:40pm. Your old favorites are only $.50 every Tuesday, starting June 7. Doors open at 9 am for the 10 am showing. No reservations are available, so be sure to arrive early. Come see some of the latest releases and your old favorites, while you cool off in the 72-degree water or picnic on the hill. All movies begin at dusk. The regular pool entrance fee covers the movies and pool entrance. Float in the pool while watching favorite movies. Admission is free after the pool closes, regular admission prior to closing. Events begin at dusk. Katherine Fleischer Park, 2106 Klattenhoff Dr. Admission is free. Ice cream and drinks will be available for purchase. Bring your blankets and chairs and enjoy these family events. Parking is limited so residents are encouraged to walk or ride a bike. Movies start at twilight, event begins at 8pm. Every Tuesday morning starting on June 7th, kids can enjoy a free movie! Tickets are given away starting at 9am on a first-come, first-serve basis. Lake Kyle Park, 700 Lehman Rd. Bring your blanket and snacks and meet your friends at Lake Kyle for movies at the lake after sunset. Free and open to the public. Admission to the Summer Movie Express is only $1 for movies showing on Tuesdays and Wednesdays. Tickets available for purchase at the box office and all movies start at 10:00 am. A portion of the proceeds goes to the Will Rogers Institute. Movies anytime cost only $2 for matinees, $3 for evening shows. Every Wednesday morning through the months of June & July, family-favorites play for a special $2.00 "Flix Jr." summer shows! Enjoy specialty milkshake offerings available in an exclusive Flix-Jr. color changing cup, ONLY available during our summer shows while supplies last. Watch a movie outside on the big screen on the lawn of the Long Center. Bring a picnic or order up some food from one of the many food trailers. Note: lines are long so bring some patience if food trailers are your plan.